A fox-hunting mural runs the course around the walls of the living and dining rooms of the Carriage Bay Cottage. Fox hunting pictures and memorabilia decorate the entire cottage and you can read "the spirit of fox hunting" on the bedroom walls. Warm rich plaids add a cozy atmosphere. The fireplace nook is the perfect spot to enjoy a cup of tea and a good book. The upstairs loft sports a comfortable sofa for cuddling or watching TV. The luxurious whirlpool tub can soothe and renew and remind that it's vacation time. The expansive deck off the western side of the cottage is the perfect spot for sunning and taking in the glorious views. The bedroom, with its king-sized four-poster bed and private deck, is the perfect place to lazily wake up and enjoy your morning coffee and breakfast. Experience "last minute vacation perfection" at The Red Horse Inn. Our renowned South Carolina romantic getaway is known for its superb lodging specials, whether folks seek the best place for their getaway weekends or the ideal honeymoon vacation spot. We're adept at providing sweet memories for 50th anniversaries and productive business conference retreats, too. When you require panoramic mountain views and luxurious accommodations, think The Red Horse Inn in Landrum, SC. iLoveInns.com. 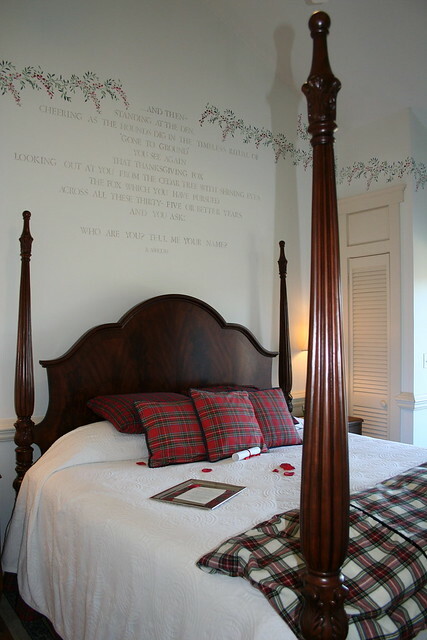 Our awards for SC honeymoon getaways and SC couples getaways also include "Best For Décor 2008" from Inns Extraordinaire. When choosing among SC romantic inns with South Carolina couples getaways in mind, come stay at the famous SC upcountry couples getaway that is known among South Carolina romantic inns as the home for South Carolina affordable getaways that really are affordable. Welcome home... to the Inn!